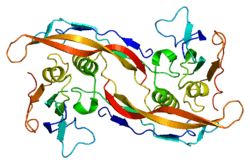 The bone morphogenetic protein receptor, type IA also known as BMPR1A is a protein which in humans is encoded by the BMPR1A gene. BMPR1A has also been designated as CD292 (cluster of differentiation 292). The bone morphogenetic protein (BMP) receptors are a family of transmembrane serine/threonine kinases that include the type I receptors BMPR1A (this protein) and BMPR1B and the type II receptor BMPR2. These receptors are also closely related to the activin receptors, ACVR1 and ACVR2. The ligands of these receptors are members of the TGF beta superfamily. TGF-betas and activins transduce their signals through the formation of heteromeric complexes with 2 different types of serine (threonine) kinase receptors: type I receptors of about 50-55 kD and type II receptors of about 70-80 kD. Type II receptors bind ligands in the absence of type I receptors, but they require their respective type I receptors for signaling, whereas type I receptors require their respective type II receptors for ligand binding. BMP's repress WNT signaling to maintain stable stem cell populations. BMPR1A null mice died at embyonic day 8.0 without mesoderm specification, demonstrating its vital role in gastrulation. It has been demonstrated in experiments using dominant negative BMPR1A chick embryos that BMPR1A plays a role in apoptosis and adipocyte development. Using constitutively active forms of BMR1A it has been shown that it plays a role in cell differentiation. Signals tranduced by the BMPR1A receptor are not essential for osteoblast formation or proliferation; however, BMPR1A is necessary for the extracellular matrix deposition by osteoblasts. In the chick embryo, BMPR1A receptors are found in low levels in limb bud mesenchyme, a differing location to BMPR1B, supporting the differing roles they play in osteogenesis. BMPR1A, SMAD4 and PTEN are responsible for juvenile polyposis syndrome, juvenile intestinal polyposis and Cowden's disease. 1 2 "Entrez Gene: BMPR1A bone morphogenetic protein receptor, type IA". 1 2 3 4 Mishina Y, Starbuck MW, Gentile MA, Fukuda T, Kasparcova V, Seedor JG, Hanks MC, Amling M, Pinero GJ, Harada S, Behringer RR (2004). "Bone morphogenetic protein type IA receptor signaling regulates postnatal osteoblast function and bone remodeling". J. Biol. Chem. 279 (26): 27560–6. doi:10.1074/jbc.M404222200. PMID 15090551. ↑ Yoon BS, Ovchinnikov DA, Yoshii I, Mishina Y, Behringer RR, Lyons KM (2005). "Bmpr1a and Bmpr1b have overlapping functions and are essential for chondrogenesis in vivo". Proc. Natl. Acad. Sci. U.S.A. 102 (14): 5062–7. doi:10.1073/pnas.0500031102. PMC 555995 . PMID 15781876. ↑ Nickel J, Dreyer MK, Kirsch T, Sebald W (2001). "The crystal structure of the BMP-2:BMPR-IA complex and the generation of BMP-2 antagonists". J Bone Joint Surg Am. 83-A Suppl 1 (Pt 1): S7–14. PMID 11263668. ↑ Kirsch T, Nickel J, Sebald W (February 2000). "Isolation of recombinant BMP receptor IA ectodomain and its 2:1 complex with BMP-2". FEBS Lett. 468 (2-3): 215–9. doi:10.1016/s0014-5793(00)01214-x. PMID 10692589. ↑ Kirsch T, Nickel J, Sebald W (July 2000). "BMP-2 antagonists emerge from alterations in the low-affinity binding epitope for receptor BMPR-II". EMBO J. 19 (13): 3314–24. doi:10.1093/emboj/19.13.3314. PMC 313944 . PMID 10880444. ↑ Gilboa L, Nohe A, Geissendörfer T, Sebald W, Henis YI, Knaus P (March 2000). "Bone morphogenetic protein receptor complexes on the surface of live cells: a new oligomerization mode for serine/threonine kinase receptors". Mol. Biol. Cell. 11 (3): 1023–35. doi:10.1091/mbc.11.3.1023. PMC 14828 . PMID 10712517. ↑ Nishanian TG, Waldman T (October 2004). "Interaction of the BMPR-IA tumor suppressor with a developmentally relevant splicing factor". Biochem. Biophys. Res. Commun. 323 (1): 91–7. doi:10.1016/j.bbrc.2004.08.060. PMID 15351706. ↑ Kurozumi K, Nishita M, Yamaguchi K, Fujita T, Ueno N, Shibuya H (April 1998). "BRAM1, a BMP receptor-associated molecule involved in BMP signalling". Genes Cells. 3 (4): 257–64. doi:10.1046/j.1365-2443.1998.00186.x. PMID 9663660. Liu F, Ventura F, Doody J, Massagué J (1995). "Human type II receptor for bone morphogenic proteins (BMPs): extension of the two-kinase receptor model to the BMPs". Mol. Cell. Biol. 15 (7): 3479–86. doi:10.1128/mcb.15.7.3479. PMC 230584 . PMID 7791754.
ten Dijke P, Ichijo H, Franzén P, Schulz P, Saras J, Toyoshima H, Heldin CH, Miyazono K (1993). "Activin receptor-like kinases: a novel subclass of cell-surface receptors with predicted serine/threonine kinase activity". Oncogene. 8 (10): 2879–87. PMID 8397373. Ishidou Y, Kitajima I, Obama H, Maruyama I, Murata F, Imamura T, Yamada N, ten Dijke P, Miyazono K, Sakou T (1996). "Enhanced expression of type I receptors for bone morphogenetic proteins during bone formation". J. Bone Miner. Res. 10 (11): 1651–9. doi:10.1002/jbmr.5650101107. PMID 8592941. Yamada N, Kato M, ten Dijke P, Yamashita H, Sampath TK, Heldin CH, Miyazono K, Funa K (1996). "Bone morphogenetic protein type IB receptor is progressively expressed in malignant glioma tumours". Br. J. Cancer. 73 (5): 624–9. doi:10.1038/bjc.1996.108. PMC 2074358 . PMID 8605097. Nishitoh H, Ichijo H, Kimura M, Matsumoto T, Makishima F, Yamaguchi A, Yamashita H, Enomoto S, Miyazono K (1996). "Identification of type I and type II serine/threonine kinase receptors for growth/differentiation factor-5". J. Biol. Chem. 271 (35): 21345–52. doi:10.1074/jbc.271.35.21345. PMID 8702914. Wu X, Robinson CE, Fong HW, Gimble JM (1996). "Analysis of the native murine bone morphogenetic protein serine threonine kinase type I receptor (ALK-3)". J. Cell. Physiol. 168 (2): 453–61. doi:10.1002/(SICI)1097-4652(199608)168:2<453::AID-JCP24>3.0.CO;2-2. PMID 8707881. Erlacher L, McCartney J, Piek E, ten Dijke P, Yanagishita M, Oppermann H, Luyten FP (1998). "Cartilage-derived morphogenetic proteins and osteogenic protein-1 differentially regulate osteogenesis". J. Bone Miner. Res. 13 (3): 383–92. doi:10.1359/jbmr.1998.13.3.383. PMID 9525338. Zhang D, Mehler MF, Song Q, Kessler JA (1998). "Development of bone morphogenetic protein receptors in the nervous system and possible roles in regulating trkC expression". J. Neurosci. 18 (9): 3314–26. PMID 9547239. Ide H, Saito-Ohara F, Ohnami S, Osada Y, Ikeuchi T, Yoshida T, Terada M (1998). "Assignment of the BMPR1A and BMPR1B genes to human chromosome 10q22.3 and 4q23→q24 byin situ hybridization and radiation hybrid map ping". Cytogenet. Cell Genet. 81 (3–4): 285–6. doi:10.1159/000015048. PMID 9730621. Souchelnytskyi S, Nakayama T, Nakao A, Morén A, Heldin CH, Christian JL, ten Dijke P (1998). "Physical and functional interaction of murine and Xenopus Smad7 with bone morphogenetic protein receptors and transforming growth factor-beta receptors". J. Biol. Chem. 273 (39): 25364–70. doi:10.1074/jbc.273.39.25364. PMID 9738003. You L, Kruse FE, Pohl J, Völcker HE (1999). "Bone morphogenetic proteins and growth and differentiation factors in the human cornea". Invest. Ophthalmol. Vis. Sci. 40 (2): 296–311. PMID 9950587. Aström AK, Jin D, Imamura T, Röijer E, Rosenzweig B, Miyazono K, ten Dijke P, Stenman G (1999). "Chromosomal localization of three human genes encoding bone morphogenetic protein receptors". Mamm. Genome. 10 (3): 299–302. doi:10.1007/s003359900990. PMID 10051328. Ebisawa T, Tada K, Kitajima I, Tojo K, Sampath TK, Kawabata M, Miyazono K, Imamura T (2000). "Characterization of bone morphogenetic protein-6 signaling pathways in osteoblast differentiation". J. Cell. Sci. 112 (20): 3519–27. PMID 10504300. Kim IY, Lee DH, Ahn HJ, Tokunaga H, Song W, Devereaux LM, Jin D, Sampath TK, Morton RA (2000). "Expression of bone morphogenetic protein receptors type-IA, -IB and -II correlates with tumor grade in human prostate cancer tissues". Cancer Res. 60 (11): 2840–4. PMID 10850425. Kirsch T, Sebald W, Dreyer MK (2000). "Crystal structure of the BMP-2-BRIA ectodomain complex". Nat. Struct. Biol. 7 (6): 492–6. doi:10.1038/75903. PMID 10881198. Wan M, Shi X, Feng X, Cao X (2001). "Transcriptional mechanisms of bone morphogenetic protein-induced osteoprotegrin gene expression". J. Biol. Chem. 276 (13): 10119–25. doi:10.1074/jbc.M006918200. PMID 11139569.